By the mid-1990s two large ungulate species had been discovered by science in the Annamite Mountains. The discovery of both the Saola and the Large-antlered muntjac stood the biological world on its head. The last large mammal to be found in this part of the world was the Kouprey, a towering wild cattle species, which was discovered in in Eastern Cambodia in 1937. And now over fifty years later not one but two large mammals had been uncovered in Southeast Asia. Few people, I think, expected that a third endemic ungulate would turn up. But that is exactly what happened. A familiar pattern re-emerged. In 1997 a joint Vietnamese—WWF team noticed odd muntjac skulls in the homes of hunters in central Vietnam. Morphologically the skulls didn’t seem to fit with the two muntjac species known to inhabit this region. For one, the antlers were extremely short, about the length of a thumbnail. That ruled out the red muntjac and obviously the Large-antlered muntjac. The antlers also lacked the distinctive second spike or browtine seen in the other two species. The pedicles—the short bony structures that precede the antlers—were also shorter in length. Pelt fragments showed that the deer was dark—almost black in color. Finally, interviews with villagers indicated that this diminutive deer tipped the scales at just over 30 pounds, making it only half the size of the more common red muntjac. Genetic analysis soon confirmed is as a new species. Scientists named it the Annamite dark muntjac (Muntiacus truongsonensis). Locals call it samsoi cacoong, or “the deer that lives in the deep, thick forest.” And like the Saola and Large-antlered muntjac it is indeed found in the darkest Annamite jungles. Shortly after its scientific debut in Vietnam it was documented in Laos. As with the other two endemic ungulates we know very little about this species. Virtually nothing is known about its basic ecology or distribution. For this reason the Annamite dark muntjac is classified as Data Deficient. However, because illegal hunting threatens all large mammals living in this region, it is probable that as future data is collected the species will be classified as Threatened or Endangered. Additional data is urgently needed if we are to devise a conservation plan for this species. But obtaining this data is easier said than done. Camera trapping has provided a few poor-quality photographs of the species. But our best bet at gathering much-needed information might be leeches. In fact, the Annamite dark muntjac was one of the species detected in the original leech paper. 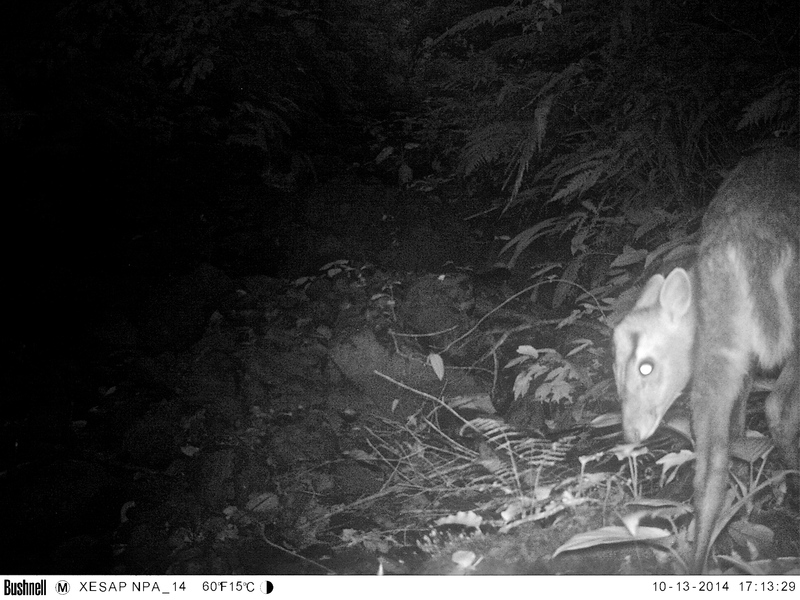 Although it had long been suspected that the species was present in the Hue Saola Nature Reserve, the detection from the original leech work was actually the first confirmed record of the Annamite dark muntjac in this protected area. The fact that thousands of wriggling ectoparasites are feeding on this elusive species thrills me to no end. I hope that my own leeches provide data on this little-known deer. It is one of the most intriguing biological mysteries of the Annamites.